It's Notion of the Month time! This month we have selected our basic Color Cards: Bella Solids, Kona Cotton Solids, Cotton Couture Solids and Art Gallery Basics. Any quilter will tell you that solids are a necessity for a quilt! A modern-leaning quilter will no doubt back me up here (hello, We Love Color!). Here’s another prime example from Pile O Fabric. While sometimes solids get to play a starring role, more often than not they are relegated to backgrounds and accents. Nonetheless, they are crucial. A background color can determine the mood of your quilt, and you can make or break any fantastic print with the right or wrong solids. With hundreds of different colors and shades, how is one to choose? Our Notion of the Month, Color Cards, have come to the rescue! These color cards from Moda Fabrics, Michael Miller, Robert Kaufman and Art Gallery are a handy dandy notions to keep with your stash. Each contains actual swatches of all the colors from the respective collection. 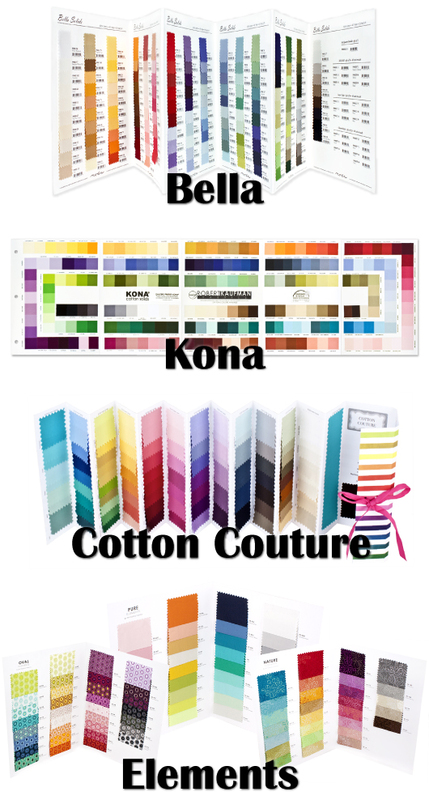 (The Kona card has 243 swatches!) With color names clearly marked, you will have no trouble finding the right solids for your quilt. Although you might have trouble narrowing it down to just one, with the abundance of colors available! And don't forget, the Notion of the Month is 20% OFF all month!